This printable sewing pattern is computer drafted and will come to you as a instant download via email. All of my patterns are delivered as a printable PDF file. You will need PDF reading software to open and print the file. 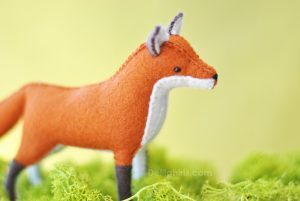 Add to your menagerie of handmade woodland creatures with this woodland felt fox pattern. This one, so far, is my absolute favorite of all the felt animal patterns in my shop. Isn’t he just adorable? This cute little fox stands just 5 inches tall and approximately 7 inches long. This pattern is made to be hand sewn with felt. I would rate this as a advanced beginner to intermediate sewing level. 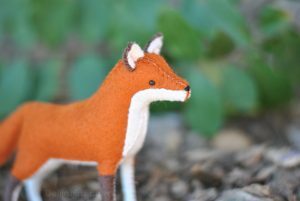 The pattern includes instructions and illustrations for sewing a handmade toy fox. My patterns include instructions for sewing in wire for a unique pose-able toy that is extra sturdy for gently play. I can picture this little fox running through our back field this very minute. Gingerly stepping through the snow and ice, over fallen logs and under the brush and brambles. I have a love hate relationship with Mr. Fox. I love his playful spirit and gorgeous red coat. But I very much dislike his pension for making a meal of my chickens. And I’m a tad suspicious of the state my cat comes home in at times.